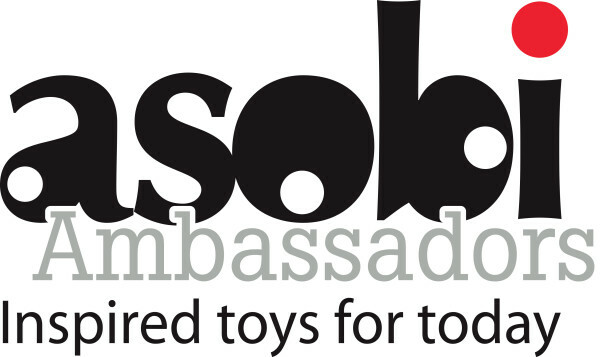 Another month, another opportunity to try a lovely toy as part of being Asobi Ambassadors. Over the past few months, little man had fun with Superhero Cape by Seedlings, he built a den with PL-UG Ultimate Den Kit, we built rockets with Curiosity Kits Rocket Launcher, little man played with Safari Ltd Toys and Quercetti Super Marble Run. This month, we tried Calafant 100% recyclable cardboard models that are easy to build and fun to decorate. You can find a wide range of models, such as dinosaurs, airplanes, fire engines, castles, tree houses and pirate ship, made with sturdy cardboard material, yet flexible and light. 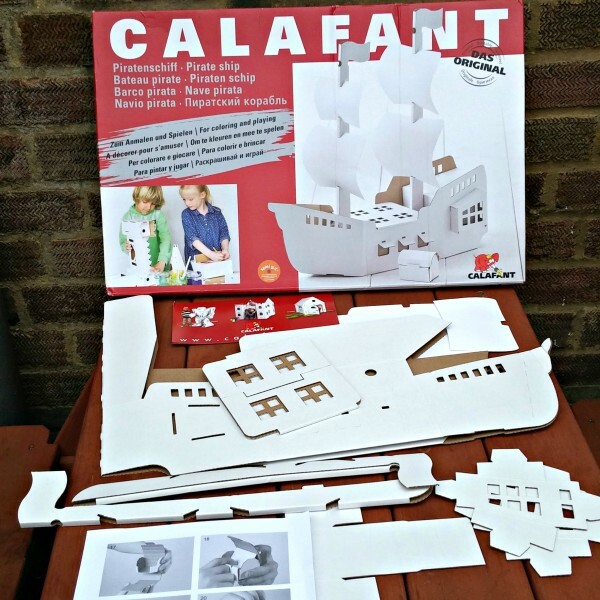 Little man was sent Large Pirate Ship by Calafant (RRP £22.95). When we opened the box, it seemed that it would be hard to put it together, but all pieces are pre-cut and pre-punched, so the model was built easily, without any scissors or glue. 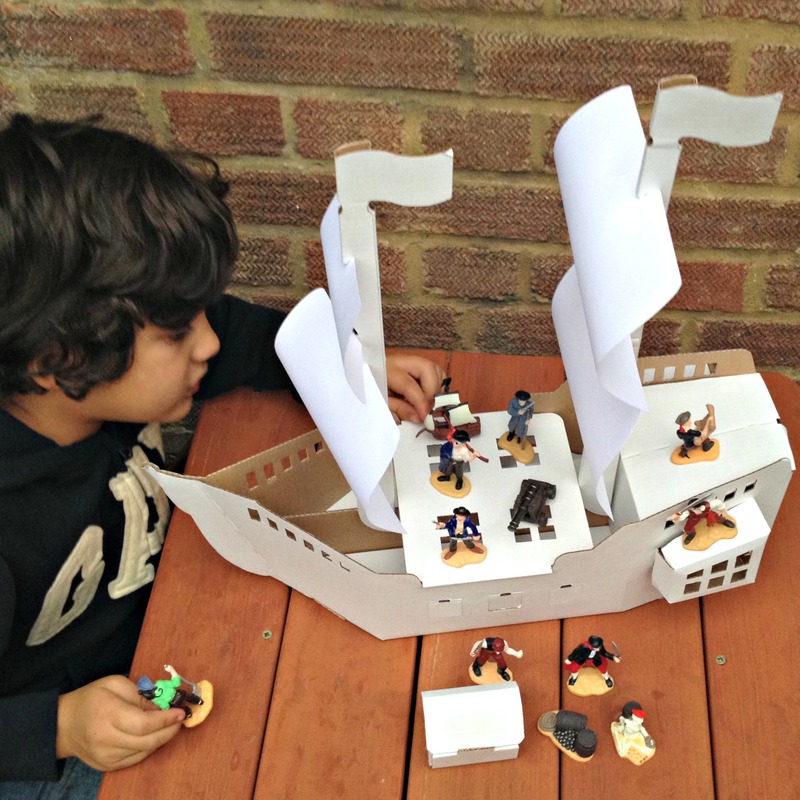 The pirate ship and treasure chest are built using an innovative slot system, following the instructions provided. The pirate ship model is recommended for children aged 6 and above, it can be played safely as there are no sharp edges or pointy bits. 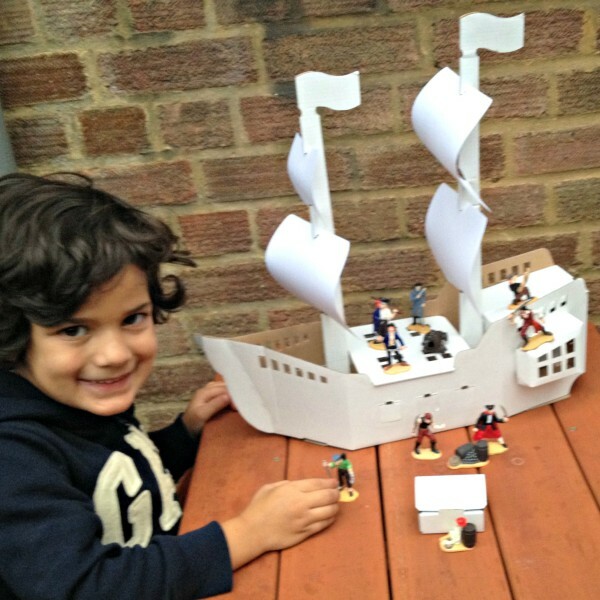 It encourages creativity and imagination, as you can play any pirate adventures with the pirate ship, creating stories w. Little man played with Safari Toob Pirates Miniature, also from Asobi. I really like the fact the pirate ship can be folded away for storage, and once little man has outgrown the model, it can be recycled. We haven’t decorated it yet, but little man is looking forward to painting the pirate ship once he has decided which colour he would like it to be. Little man really enjoys playing with the pirate ship and going on adventures! Kind Toys are offering a 20% discount off all Calafant toys throughout September, simply use the discount code CALAFANT at the checkout. For your chance to win a Large Pirate Ship, like the one in the picture, please fill in the Gleam app below. You MUST leave a comment and subscribe by email (compulsory entries), you can also gain extra entries by tweeting (daily entry), subscribing to other social media channels, etc. T&C’s: The winner will be randomly picked by Gleam after the closing date on Monday 22nd September 2014. Lilinha Angel’s World will contact the winner by email or Twitter within 7 days wherever possible and will allow 7 days for a reply. Open to over 18′s and UK only. If I do not hear anything within this time period I reserve the right to redraw a winner. Lilinha Angel’s World decision is final. Once you’ve entered the giveaway, check out other Calafant reviews and giveaways at A Mummy Too, Edspire and Susan K Mann, Real Housewife of Suffolk County, Innocent Charm Chats, Blog By Baby, Dancing In My Wellies, Hello From Jo, Red Rose Mummy. 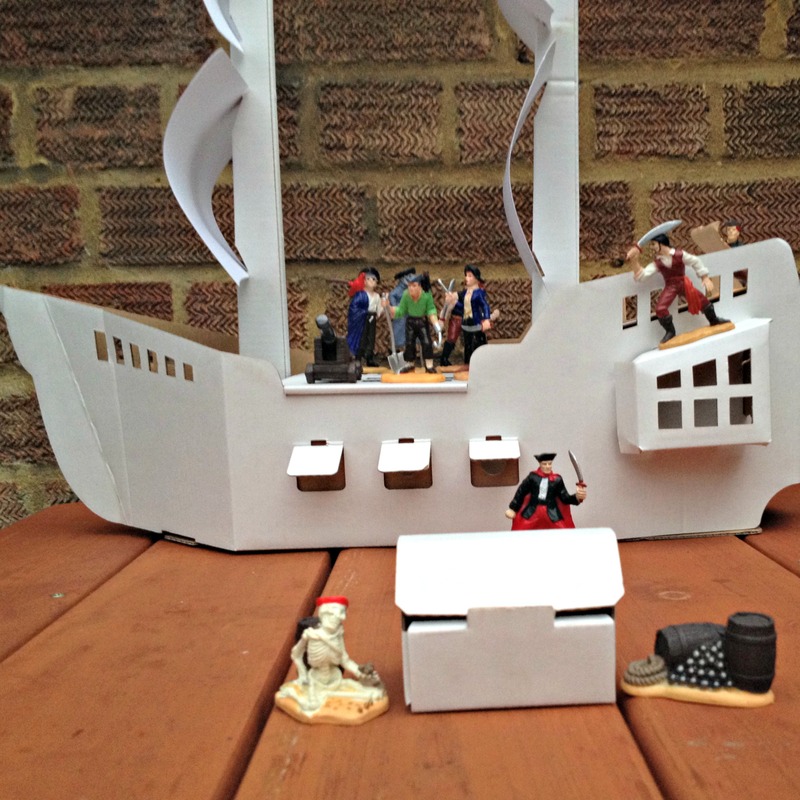 107 Responses to "COMPETITION: #Win Large Pirate Ship by Calafant #AsobiAmbassadors"
my kids and us parents! Both my two boys! Thank you! My sons little cousins would love the pirate ship would be great gift! My son would start doing it and I would probably have to help him finish it. My stepdaughter, there’s not much girly about her! My little boy and I would love to construct and play with this! My Niece, she loves pirates. both my boys would really love this looks fantastic! My monkey son and me! I would enjoy it with my son and my daughter! my son would love that. me and my 5 year old Harvey would have lots of fun with this! My 4 year old son! Looks good for family piza night when the kids take over my world. My son would love this pirate ship! My 2 sons would love it! My son and his 3 cousins! My daughter’s class is doing a Pirate project at school, they’d love it. My grandsons Bailey and Shay. They love to play pirates! My 5 Year Old, Hallie-Anne, she is going nuts for a boat at the moment, my partner had to set up my step-brothers lego boat and as soon as she seen it she wanted to play with it, when I explained that she couldn’t because Joe(my s/b) hadn’t eve played with it she threw the most almighty diva fit and finished with ”Uuuurgh Why couldn’t Grandad do it, next time tell him to do it and not to put temptation here”!! 5 going on 15!! I think both of my little ones would love it. I have 2 boys who would both love this!